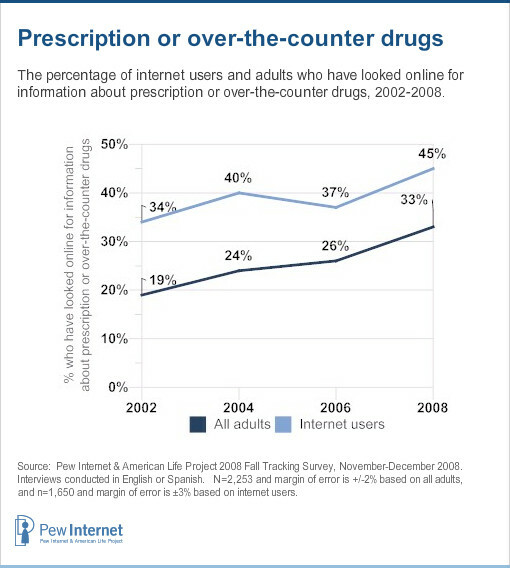 45% of internet users look online for information about prescription or over-the-counter drugs. More Americans are looking online for information about prescription drugs and other treatments than they were in 2002, and more Americans are continuing to search for prescription and over-the-counter drugs than for alternative or experimental treatments. Searches for prescription or over-the-counter drugs saw a significant jump over the last six years. 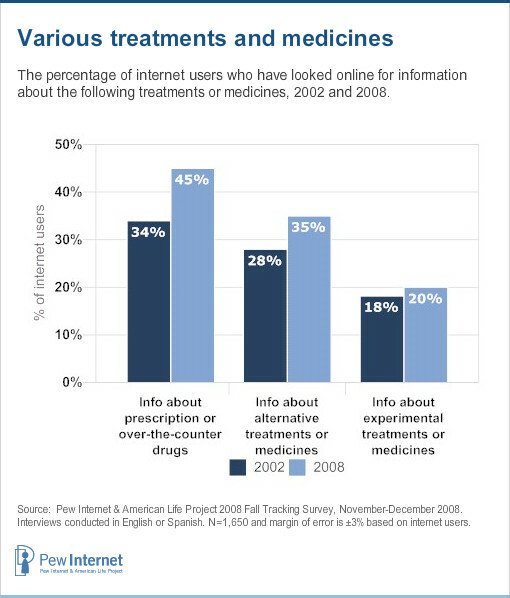 Currently, 45% of online adults look for information about prescription or over-the-counter drugs, up from 34% in 2002. Women are significantly more likely than men to look online for information about prescription or over-the-counter drugs. Whites are more likely than African Americans or Hispanics to look online for information about prescription or over-the-counter drugs. 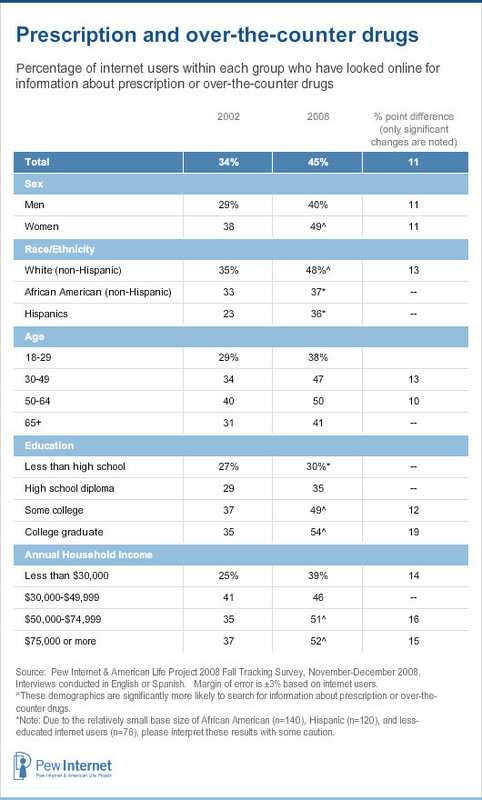 Those with at least some college education are significantly more likely than those with no college education to search online for information about prescription or over-the-counter drugs. Internet users in households making $50,000 or more a year are significantly more likely than those making less than $30,000 to look online for information about prescription or over-the-counter drugs. While most adults looking online for information about specific treatments weigh many different options, those seeking prescription or over-the-counter drug information are less likely to look at alternative or experimental treatments. 23% have looked into all three: prescription or over-the-counter drugs, alternative treatments or medicines, and experimental treatments or medicines. 15% of adults who look online for information about alternative treatments and medicines look exclusively for that information; they do not look for information on prescription or over-the-counter drugs or for experimental treatments or medicines. 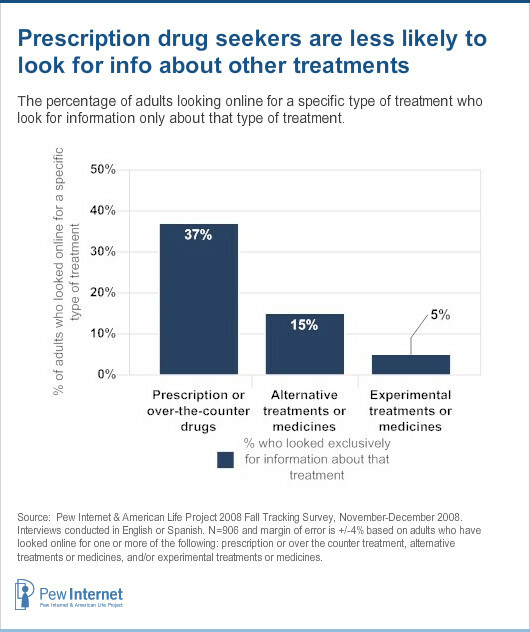 5% of adults who look online for information about experimental treatments and medicines look exclusively for that information; they do not look for information on prescription or over-the-counter drugs or for alternative treatments or medicines. This difference in search habits suggests that those looking for information about alternative treatments – and especially those looking into experimental treatments – are much more likely to research, or have researched, other treatment options as well. On the other hand, those looking for prescription or over-the-counter drugs are less likely than those seeking alternative and experimental treatments to look into other methods of treatments.